Our government has abandoned us at the border. at the link posted below after the “smoking gun” story . 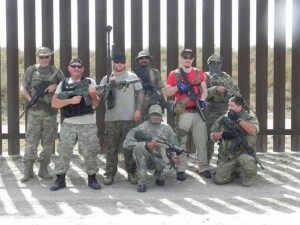 Pic of citizen patriots filling the void on the border. The “smoking gun” at Logan Airport in Boston. The eyewitness accounts surfaced in a lawsuit brought by the family of Mark Bavis, a Los Angeles Kings hockey scout who died in one of the hijacked Boston flights. Because the case was settled in 2011 for several million dollars and never went to trial, the evidence never aired in open court. Over the objections of federal authorities, the Bavis lawyers later made the risky decision to dump the FBI interviews and deposition transcripts into the public archives. We are not acting in the best interest of our country to protect and preserve our safety, our security and our liberties. Political correctness amongst other things have removed our ability to act in our own best interest. In Logan Airport on May 11h 2001 no action was taken. He ( an airline employee) said he reported Atta to higher-ups, who told him, as he relayed to Spagnuolo, that there was nothing they could do about it. In fact, airport security had clear authority to investigate anybodysurveilling a checkpoint at the time, and such activity should have raised major red flags. Just two months earlier, federal authorities advised airlines, including American, that al Qaeda terrorists typically conduct surveillance before attacking a target. At least three eyewitnesses spotted al Qaeda hijackers casing the security checkpoints at Boston’s Logan Airport months before the 9/11 attacks. They saw something and said something — but were ignored, newly unveiled court papers reveal. Instead, the worst terrorist hijacker in history was allowed to waltz through security without anyone stopping him, asking his name, checking his ticket, taking a picture, looking at his drivers license or passport, opening his bags or patting him down. Four months later, on Sept. 11, Atta passed through the same security checkpoint. His carry-on bag got past screeners despite containing box-cutters and mace or pepper spray. He took his seat in business class of American Airlines Flight 11 unimpeded. We, as a people, and most particularly our leaders at all levels of government, have lost the ability to act in our own best interest. It is certainly in our best interest to defend and secure our International Borders. 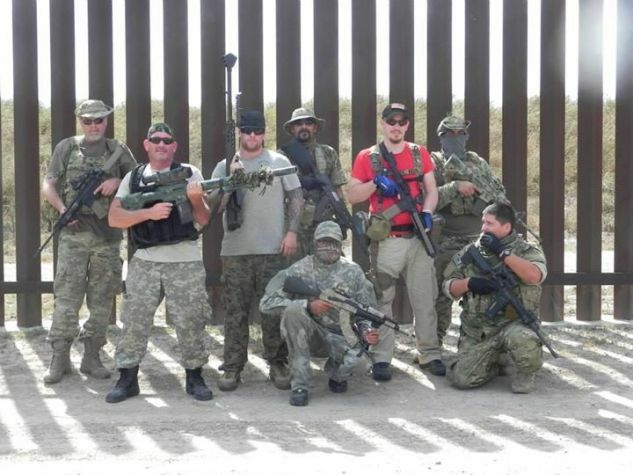 The following group of citizen patriots is doing that right now on the border in Texas. Note: There are other groups on the border. The UPA is in contact with this group and another group in Arizona. Any information reported in the UPA report is information that is already in the public domain. Debut of Camp LoneStar Border talk Radio show. Show will be broadcast live from Brownsville Texas and we will discuss the immediate issues facing us on the Border. We will be talking about Border Patrol and the obstacles they have placed in front of us, the “patriots” who are going around spreading false information and those who are attempting to profiteer from the blood and sweat of those who are actually doing the job of securing our border. We will talk about our immediate Camp needs and how those who want to come help can, and those who want to donate will be given our latest ways to get support to the border. Thanks and we look forward to hearing from you the American People and Patriots. Archie Seals and I will be on to talk about what is happening on the Border. How is the following presidential memorandum in the national interest? And how is it in our national interest to allow passengers from Eboli stricken countries to fly here through Brussels. The admission of up to 70,000 refugees to the United States during Fiscal Year (FY) 2015 is justified by humanitarian concerns or is otherwise in the national interest; provided that this number shall be understood as including persons admitted to the United States during FY 2015 with Federal refugee resettlement assistance under the Amerasian immigrant admissions program, as provided below. Excellent speech by the founder of Oath Keepers, Stewart Rhodes, inGrants Pass,Oregon- reminding the large audience that preparing for the imminent hard times ahead is necessary prior to the unexpected event. Europe, wherever it is found, is in a life-or-death struggle against displacement by aliens who will transform our societies in ways that would make them unrecognizable to our ancestors. Men of Europe, my brothers, we must stand together. We must struggle together, so that together we will prevail. Let me conclude by reiterating the main themes of my talk this evening. First, Europe is wherever we find Europeans, whether they are on the continent of Europe or across the sea. Second, what we Europeans all hold in common is not merely a culture, a history, a way of being, but also the common kinship that we call race. Third, Europe, wherever it is found, is in a life-or-death struggle against displacement by aliens who will transform our societies in ways that would make them unrecognizable to our ancestors. We must be, all of us, comrades in this great struggle for the defense of everything that we love, in this struggle for the defense of Europe.Today, the lines are not so clearly drawn, the crisis is not so sharp, but for our generation, this is Thermopylae, this is Poitiers, this is the Siege of Malta, this is Blood River. Same article as above but different excerpt. The threat to Europe everywhere is very great. The official America ideology is “diversity,” which means national suicide through immigration: the replacement of European people by non-Europeans. As you may know, in 1960, the population of theUnited Stateswas 90 percent white. Until 1965 theUnited Stateshad immigration laws that were designed to keep it European. Since that change in policy, non-white immigrants have poured into theUnited States, and now my country is only 62 or 3 percent white. Current projections are that in just 28 years, whites will be a minority. Of course, diversity is a terrible weakness. It pits different groups against each other and destroys trust. In every part of the world, when peoples who are different in language, religion, or race try to share the same territory, there is conflict. This is virtually a law of nature, but American ideology attempts to rewrite the laws of nature. It was a bold idea from the beginning. The National Policy Institute (NPI), an American organization, was to hold a conference in Budapeston “The Future of Europe.” In addition to well-known identitarians such as Philippe Vardon of France, Markus Willinger of Germany, and myself, the controversial Russian academic Alexander Dugin, was to take part. Hungary’s Jobbik party would provide essential support on the ground, and one of its elected representatives was to address the meeting. However, about two weeks before the conference, prime minister Victor Orban came under pressure from the Hungarian Socialist Party and condemned the conference. His statement mentioned Mr. Dugin by name, and characterized NPI as a “xenophobic and exclusionary” organization. Those of us scheduled to take part began to worry that pressure would build on the LarusEventCenter to cancel its contract to host the conference. Mike Lee: no attorney general who supports Obama’s planned executive amnesty should be confirmed. Standard military strategy is to secure your homeland when at war. Until such time that we secure our borders and repatriate our Islamic enemies we will never succeed in winning this war that Islam has brought to us. When a country goes to war it must secure its homeland first. No politicians or military leaders have even mentioned this. We must take the following steps and many more not listed. Send US Military to the borders. All local and state governments should begin immediately to enforce all national immigration laws. All refugee resettlement programs must stop immediately. All travel to US must be approved by visas. No more travel by passports. The visa entry exit program must be put into place along with strict enforcement of violations. Remove all Muslims from our government and from our military.